Sweaters are so satisfying to knit and wear, but at some point in the process, things definitely start to drag, and it seems like you're a) not making any progress, and therefore b) never going to finish and get to wear the beautiful creation you've been slaving over. In the last two weeks I have discovered two solutions to the problem of sweater doldrums. Solution #1: Use bulky yarn. 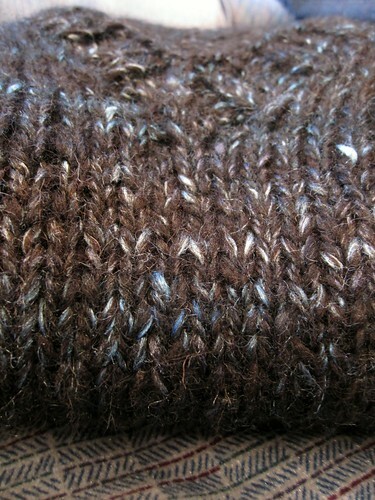 Yarn: Handspun Porpoise Fur Shetland/silk in "Magpie", approximately 500 yds/1 lb of bulky, squishy 2-ply. 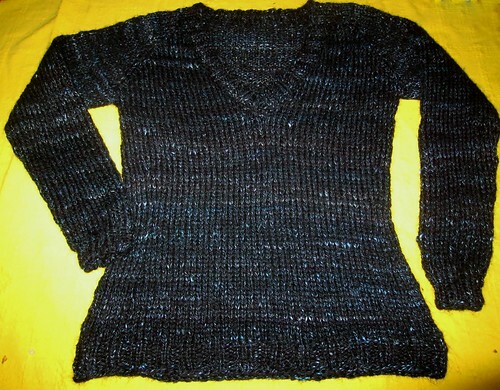 This is my barter sweater, and it was started and finished (spinning and knitting) in less then two weeks. It would have been done in about 9 days, but I ran out of yarn and had to spin up a bit more, so that stretched it out a bit longer. Still, 9 days for the whole project, and about a week to actually knit the sweater, is pretty hard to beat for almost-instant sweater gratification. 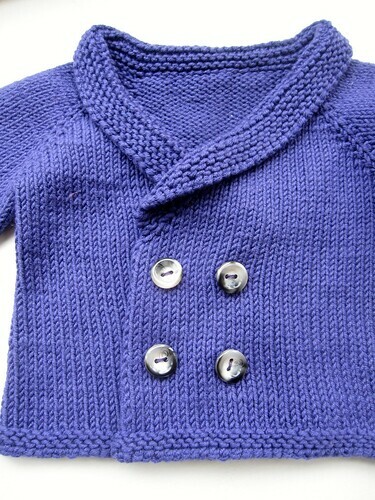 Solution #2: Knit baby sweaters. Yarn: Adriafil Duo Comfort Classic, 131 yds/50 gr, the 3-6 month size used less then two balls. Comments/mods: talk about instant gratification! My new nephew arrived on Valentine's Day, I started on Friday after some frenzied stash diving, and the knitting was done on Tuesday. Boo and I bought some buttons yesterday and I sewed on the snaps and buttons today. I did a few mods. First, I did fewer short rows on the shawl collar because I didn't want it too get too long and floppy. I like this mini-shawl alot. 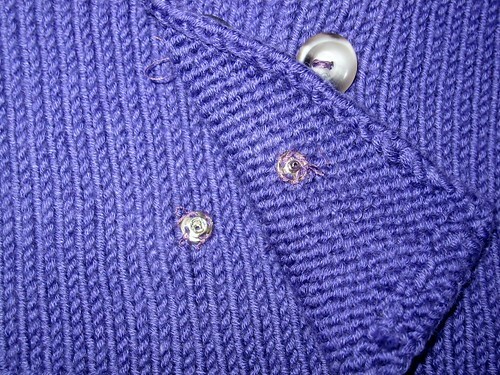 I worked the garter stitch edging on the sleeves back and forth instead of in the round. It was only 5 rows or something, so sewing up that tiny bit on the end of the sleeves wasn't a big deal. I also skipped the buttonholes, choosing instead to sew on the buttons on the outside as a decorative element, and using snaps to hold it closed. I think this will work better for getting the sweater on quickly and for keeping it closed. 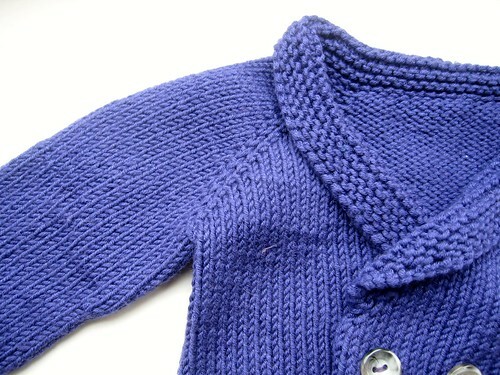 I'm sorely tempted to put leather elbow patches on, since the baby's Dad is a professor. I think in the interests of getting it sent off to the States quickly, I'll forgo that, but wouldn't it be adorable? 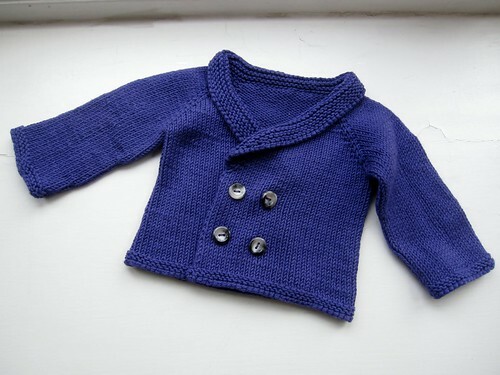 Written by porpoise On February 22, 2013 In "Porpoise Fur", "baby", "gifts", "handspun", "sweaters"